ONCHAN, Isle of Man – May 25, 2017 – PokerStars has awarded a grand total of $12.5 million to eleven PokerStars players, over the span of just eight weeks as part of PokerStars Makes Millionaires. The promotion brings the total number of poker millionaires created at PokerStars, an Amaya, Inc. (Nasdaq: AYA; TSX: AYA) brand, up to 208. 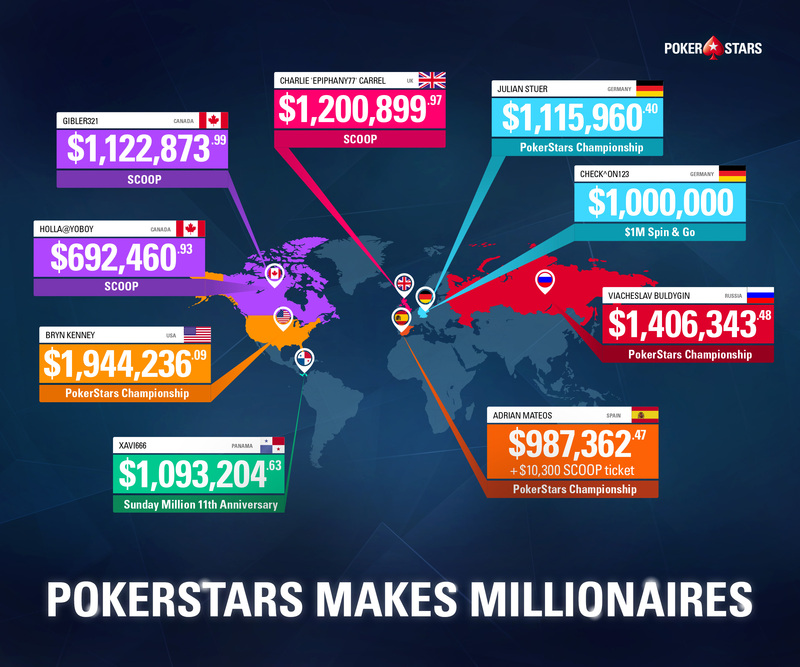 “The ambition behind the PokerStars Makes Millionaires promotion was to create an unprecedented number of poker millionaires in a short period of time and we have succeeded in doing this. Once again we have confirmed our position as the only poker operator that has the ability to give players so many huge winning moments via so many great promotions, exciting live events and online series,” said Director of Poker Marketing Vadim Soloveychik. “We are committed to providing an excellent poker experience for our customers and continuing to provide the biggest and the best poker, through both online and live events,” he added. After completing the Spin & Go 2X Daily Challenge and Millionaire Grand Final Daily Qualifier in just two days, ‘nick2101983’ told PokerStars how “everything went great!” when he topped the Millionaire Grand Final tournament bringing home $1,000,000 on April 24. An array of millionaires were crowned in Monte Carlo. The €100,000 Super High Roller saw Bryn Kenney from the USA win the tournament on April 29 to bring home $1,944,236.09. Russian Viacheslav Buldygin came second for $1,406,343.48. Spaniard Adrian Mateos won the €50,000 Super High Roller for $990,773.07 on May 1, unfortunately just missing out on earning a million. PokerStars awarded Mateos with a $10,300 SCOOP ticket for his great achievements throughout the tournament. Additonally to the Super High Roller win at Monte Carlo, Mateos also topped the SCOOP tables and won the SCOOP-30-H: $2,100 NLHE [6-Max] for $234,030, during the PokerStars Makes Millionaires promotion which proved his million dollar earning poker skills. Julian Stuer from Germany became a millionaire on May 5 when he won the €25,000 High Roller for $1,081,917.79. The $1 million Spin & Go jackpot hit twice during PokerStars Makes Millionaires. On May 9, ‘Check^On123’ from Germany spun $1,000,000 into their bank account from a $100 stake and a week later ‘meks2410’ became a millionaire for just $10. Canadian Former November Niner Gordon "holla@yoboy" Vayo won Event-01-H $1,050 on May 22. PokerStars guaranteed $1 million for the player who came in first, however the final five players collectively decided to cut a deal, resulting in Vayo taking home $692,460.93 and second place walking away with $745,000. In total the top five players shared $2,782,385.87. The decision to land his largest ever cash was described by Vayo: “It’s just a silly amount of buy-ins to be playing for given the variance of five-handed play. I’ve been around long enough to take the equity when I can get it”. The $10,300 Main Event High created two millionaires on May 23. Charlie ‘Epiphany77’ Carrel from the United Kingdom won the event for $1,200,899.97, despite having connection difficulties and having to jump between internet cafes whilst playing in Mexico. In second place was ‘gibler321’ who cashed a sweet $1,122,873.99. Exchange rates were used at the time of the win.